Classification: Planet in an unknown galaxy, but apparently within the Earth-616 dimension. also "Hatt," Myookis Palookis," and "Protektin Surv"
(MGN#29 (fb) - BTS) - Matriculon is a commercial, free-orbiting planet whose specialty is change. It is the home of the universes master terra-formers, alchemists, and shape-changers. It serves as the location from which these being hire out their talents. Communications equipment on Matriculon can receive transmit information from anywhere in the universe. The evening news on Earth is viewed by many natives of Matriculon, where it is perceived as a horror show. (MGN#29 (fb)) - Scientist Mall Addy developed the latest Big Change in Nutrition, and the Federation of Matriculon determined this to be of such great importance that they summoned Addy in order to be certain that this product was marketed fairly. This concern was brought on by reports that Addy had been kidnapped by Nasty McBurne, an agent of the infamous Banger McCrusher Mob and Food Outlet. The assignment of recovering Addy was given to a long-time bureaucrat, Stamben Malelet, He required assistants who were large and rugged, who would work cheap, and who weren't too smart (or else they wouldn't do it); he chose the Hulk and the Thing. (MGN#29) - Malelet beamed the Hulk and the Thing to Matriculon, and infused the Hulk with positive cerebral ions to maintain him in a manageable state. Malelet convinced the pair to assist him by demonstrating the ability inherent for change in Matriculon, and offering them two wishes--of any type. He then telepathically imprinted Addy's location on their minds. 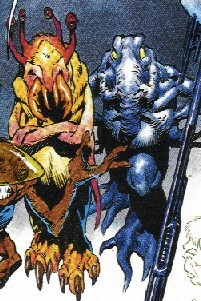 As the two headed out, they quickly realized that their large and monstrous forms stood out even amongst the diverse inhabitants of Matriculon. 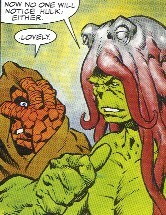 The Thing wrapped himself in a cloak, and the Hulk smashed a squid-like creature over the head and wore it as a wig. The two hitched a ride a ride with a repulsive, malodorous, mucus-dripping, slug-eating creature carrying a cargo of twenty tons of Vegan worm waste. 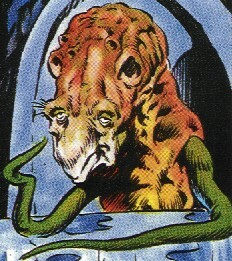 Things went fine until the Thing's hood slipped down and the driver recognized them as the ugly monsters from the 6 o'clock horror show, and ejected them into the biological waste reclamation plant. A short, smelly ride on a conveyer belt dropped them into a swamp, where they encountered a Thulcan Death Rob, which they only managed to disable through dumb luck. Across the swamp, they entered McCrusher's Secret Headquarters and Burger Warehouse, filled with an army of McCrusher's toughest agents. 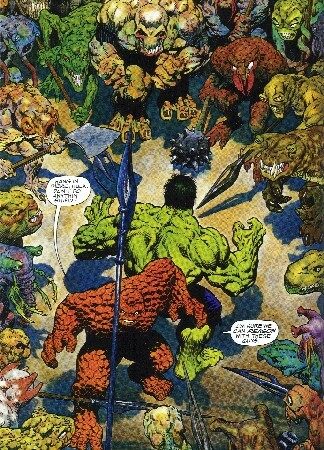 The Hulk reasoned with them, and then they moved on...yes, really. The Hulk put them to sleep with an hour and a half of a mostly monosyllabic monologue concerning the meaning of life, the high points of which were his explaining how mutton stew is the closest thing you can get to being in heaven, and how brass buttons hurt his eyes. 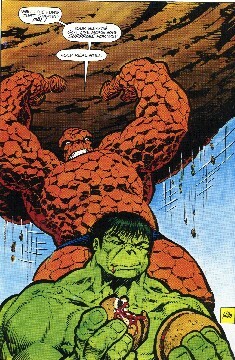 Thing: "Hulk, did ya hear what that creep said about your mother? He claims she had a personal relationship with the Greenbay Packers! He says that's why ya came out the way ya did, dumb and green! He accuses ya of countin' on your fingers! He blames ya for Howdy Doody going off the air! He says yer a commie! A Red! A Pinko! Hulk: "No! Hulk is Green! Hulk Smash!" 'Nuff said. 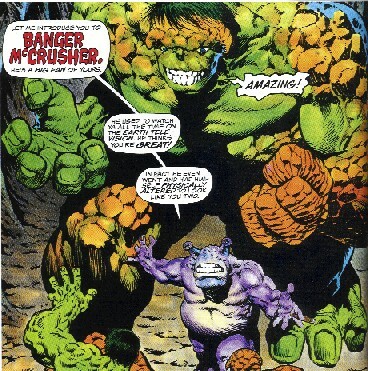 The combined power of the Thing and the enraged Hulk put the kibosh on McCrusher. McBurne surrendered to them, and then Malelet teleported them all back to his base. There he revealed the all-important purpose of Addy's Big Change, although the Thing was less than satisfied (see below). We want food and we want to go home. The two were beamed back to Earth, in a desert, atop a mountain of hamburgers (complete with plenty of ketchup packets). 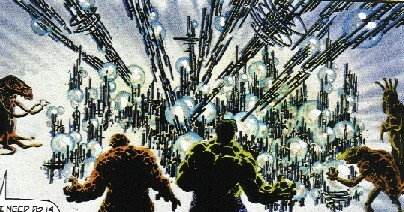 The Hulk was quite satisfied with the days events: "Rockman is all right. Rockman is Hulk's friend." And then the Thing smashed a big boulder over his head. Comments: Created by Jim Starlin and Bernie Wrightson. I can't do this story justice in the profile. Buy and read it. You'll have a smile on your face the whole way through. Mall Addy (Malady), Maika Kopi (Make a copy), Fyleten Looset (File it and lose it), Stamben Malelet (Stamp and mail it). I'd ASSume McCrusher and McBurne were just parody's of the big burger joint...you know the one. The inventor of the Big Change in Nutrition, he was a scientist and had no interest in fisticuffs. 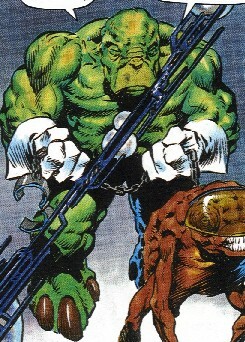 He was kidnapped by Nasty McBurne, and just sat there as a captive until the Hulk and the Thing came to rescue him. It's a special food additive, that, after being run through a multi-dimensional cyclotronic displacer, changes food in two ways: (1) it makes it smell great, (2) it makes it taste great. The Thing was less than pleased with having gone through all of that grief for some cosmic A-1 sauce. He was a minor bureaucrat of the Federation, and an expert at going unnoticed and being obscure. He had hoped that his talent would get him through to his pension without ever having to assume any responsibility for anything, ever. His luck ran out when he was chosen by lot to deliver a certain document: the summons for Mall Addy. Having no wish to get directly involved with McBurne or McCrusher, he decided to call on the one maneuver that had never failed him: delegation of responsibility. It was Stamben who summoned the Hulk and the Thing. 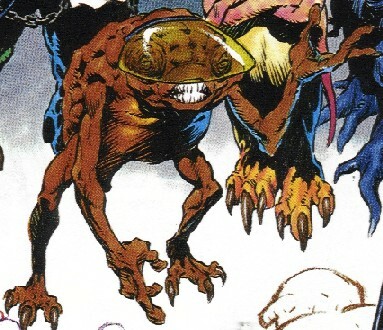 Malelet had great metamorphic abilities and could also alter the environment and beings around him. 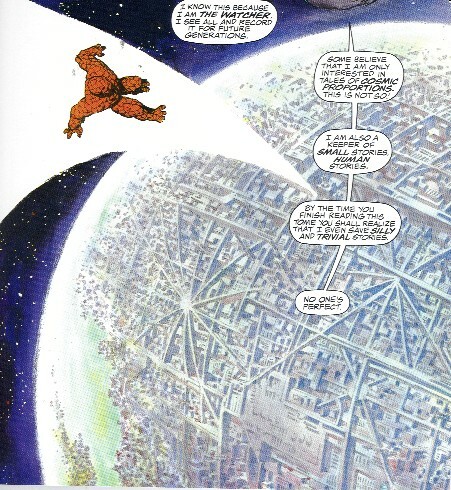 His speech made it appear that his abilities were typical to the "Matriculites," or perhaps he was harnessing advanced abilities of the Federation for the purpose of enlisting the Hulk and the Thing. The go-to guy for Banger McCrusher, it was he who abducted Mall Addy. While he was more than tough enough for the likes of Addy or Malelet, he surrendered immediately to the Hulk and Thing after they took out McCrusher. He was turned in to the authorities for his involvement. The head of the infamous Banger McCrusher Mob and Food Outlet. He had seen the Hulk and the Thing on television from Earth, and had himself altered to mimic then. He just didn't realize that they were so puny. His gang ruthlessly tried to control the fast food market on Matriculon, and he had his agent, McBurne, kidnap Mall Addy to obtain the world's greatest food taste enhancer. He was a tough customer, but eventually fell before the Thing and an enraged Hulk. Some of his other agents can be seen above. 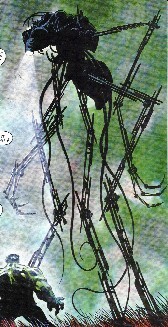 The robot operated in the swamp outside McCrusher's HQ, and was presumably under his control. It identified the Thing, but was unable to recognize his partner, until removing his chapeau. 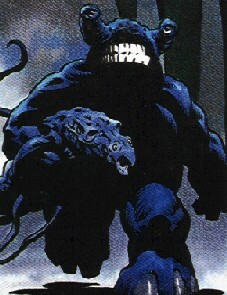 Upon confirming their identities, it metamorphosized into a much bigger and nasty form, which proved resistant to even the Hulk and the Thing's power. 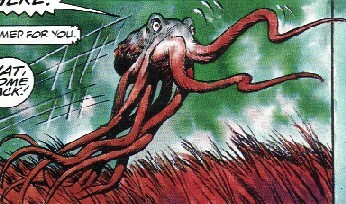 However, when the Thing tried to hide from it, it tripped over him, lost control of its gyros, and ended up in the swamp, where it apparently short-circuited. They were two of the head bureaucrats of the Federation, and were on-hand when Mall Addy was recovered. This guy had a friendly, though brief, conversation with the Thing, before the Hulk popped him on the head and knocked him out to use as a disguise. The disguise was foolproof, as neither the people of Matriculon or even a Thulcan Death Rob could identify the Hulk...until the hat came off. Upon waking up and seeing the Death Rob, Hatt immediately fled. He hauled cargo--often nasty, stinky stuff, enjoyed eating slugs, and wasn't shy about picking up hitch-hikers. However, when the Thing's cloak slipped back, he recognized him as that ugly monster from that Earth horror show, the Six O'Clock News, and ejected both of them from his vehicle, posthaste and forthwith. He was on hand to take in Nasty McBurne. He wasn't sure which one he was, because the whole group looked pretty nasty to him.